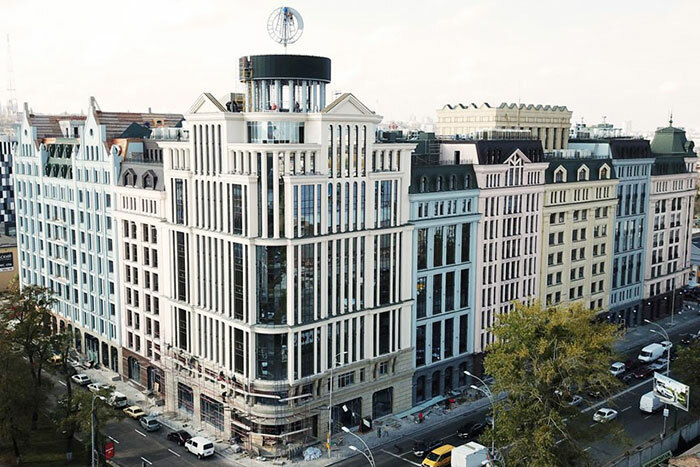 It is the first newly opened Business Centre in the Ukrainian capital for half a decade and is the first property of its kind in the country to be certified to International standards for sustainable construction: the ASTARTA Organic Business Centre. It sets the standard in the vibrant, Eastern European metropolis - not just in terms of sustainability, but also in terms of comfort. Knauf AMF played an important role in this. The company from the Bavarian Forest supplied acoustic solutions for the construction project for a pleasant and peaceful interior atmosphere. The city with two faces. The Western side of the Dnjepr, where Kiev was founded.is hilly and green, whereas the Eastern part of the metropolis with almost three million people is flat and peppered with lakes. Historic buildings on one side, office and apartment buildings on the other and in between a lot of green. Almost half the city is made up of green space. The new ASTARTA Organic Business Centre is located in Kiev's historic district of Podil. It is only a stone's throw from the western bank of the Dnieper River. With a total of 62,500 m², spread over nine floors, it offers space for all kinds of business. It is the first of its kind in the whole of the Ukraine. 36,500 m² alone is made up of state-of-the-art, spacious offices, all of which have natural light and open views to the outside. In addition there are areas for conference and event facilities, restaurants, cafes, banks as well as 3000 m² of private park in the courtyard of the complex. The client and operator TEK Energoinvest pay tribute to the green soul of the city. Lawns, trees and fountains are not only available to tenants and their employees, but are also open to the residents and visitors of the city. The design team, consisting of architects from the Ukrainian Kramall Studio and architecture and design experts from the London Strategic Consulting Group, created an exciting symbiosis between city and nature for the ASTARTA Organic Business Centre. Two faces between tradition and modernity, between liveliness and peace. The postmodern exterior of the building complex blends seamlessly into the historical face of one of the oldest districts of Kiev. However, behind the coloured facades everything is high-tech. The energy-efficient building envelope, ventilation systems with heat recovery, highly efficient LED lighting, intelligent building automation and the choice of materials for energy balances and life cycle analysis, set standards in the region and are also responsible for the successful certification according to the BREEAM International 2013 standard. When you enter the ASTARTA Organic Business Centre, you are greeted in the spacious foyer by warm, natural shades and wrapped in a kind of pleasant tranquillity - despite the heavy public traffic. This is remarkable, as the centre is on a busy intersection, flanked by one of the city's main streets and much of the office space is already leased. To separate the building from the outside world and the hustle and bustle, the designers relied on the experience of the acoustic experts from Knauf AMF. For effective sound absorption and pleasant acoustics in the entrance area, they recommended HERADESIGN® macro magnesite-bonded wood wool acoustic tiles in 1200 x 600 x 25 mm format. The single-layer, white-coloured tiles with three millimetre wood fibres are installed on the ceilings throughout the ground floor. Their lively surface structure ensures the 720 m² has a natural texture and is thus in perfect harmony with the philosophy of the building - not least because of wood as the natural raw material. "On the ground floor, especially in the reception area, the urban hustle and bustle and noise of Kiev should be taken away to immerse the visitor in the special atmosphere of the building," said Igor Aleksandrovich of the architectural firm Kramall Studio. "The acoustic solutions used should not only offer a function. They had to allow creative freedom, emphasise the high-quality appearance of the architecture both inside and out and reflect the basic idea of a 'green centre'”. The 700 gold brown HERADESIGN® Baffles provide the foyer with creative highlights and excellent function. The 1800 x 300 x 30 mm elements, suspended vertically from the ceiling, create islands in the reception area and the nearby seating area in the foyer. The single-layered acoustic solutions allow focused, intensive sound absorption for discrete dialogue. "From the very first exchange of ideas regarding the challenges in the foyer of the building, it was clear to us that everyone involved had a common understanding of how to translate the designer’s vision. Our focus during the project was on using and combining our products, their functions and structures in a way that creates the unique impression that visitors experience when entering and staying in the foyer," says Maria Bokun, Area Sales Manager at Knauf AMF in Ukraine. On the upper floors, it was important to ensure that tenants would find a perfect foundation for designing their own office space. Here, too, the high-quality design language is intended to continue, without the elements imposing or specifying the direction of individuality. For this reason, the corridors used THERMATEX® Star mineral ceiling tiles with VENTATEC® T15 grid structure. It’s very fine, irregular perforation provides a high-quality surface appearance and at the same time gives the ceiling outstanding acoustic properties. Moreover, fire protection regulations are easily met. Ideal conditions for companies that want to place their headquarters in this flagship project of the city.